Do you ever go to the beach and wish you could bring something back home with you? Other than the tons of sand in towels, beach toys, and shells, that is? When I was growing up, we had really hard well water. After a while, of course, the minerals from the water would build up on our hair. Every time we went to the beach, Mom would luxuriate in how the soft beach water made her hair feel – soft, light, and conditioned. When my parents built their house some 20ish years ago, one of their top priorities was a water softening system, because Mom wanted her hair always to feel soft and not weighted down. Also when I was growing up, my grandparents had the best water. They lived 20 minutes from us (so nowhere near the beach), and that water made the most amazing coffee! It was so good and turned this one-cup-a-day drinker to a 3-cup drinker while I was at Grandma and Grandpa’s. When I was in high school, my grandparents got a place at the beach so Grandpa would have someplace to stay when he was fishing. Welcome beach water! It had the same sweet flavor of my grandparents’ water, but even better! Fast forward several years to my meeting Peter and spending time at his parents’ beach house. I was living in a place with awful municipal water; I had to add lemon juice to make it palatable to me. But the beach house… One sniff and I knew the water would be as incredible as at my grandparents’ home. I tasted it and was sent back to their house while I was growing up. Cup after cup of the smoothest coffee went down while I sat or stood on the dock, savoring the delicious flavor dancing on my tongue. Fast forward a few more years, and since we couldn’t bring enough water back to keep me satisfied, we went to where the water is. We moved to the beach, and the water is almost as smooth and soft as what my Grandparents had. (And I certainly drink enough of it!) A little farther east, and we discovered the water at Kure Beach is reminiscent of that which was at the beach house. I can bring a little of that back with me, and I do every time we’re there. Moving to the beach isn’t an option for many people. Some can’t afford it, some prefer living elsewhere, and still others love the idea all the way up to hurricane season, when the idea doesn’t seem quite as winning. When you can’t turn your vacation into something more permanent, you can bring the beach back home with you (no vacuuming required). 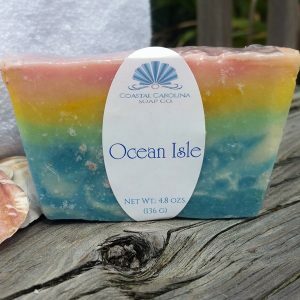 Wherever your vacation takes you along our glorious North Carolina coast, we have a soap for you so you can savor those vacation memories just a little bit longer. Starting on the northern part of the coast takes you to world-class surfing, wind-swept dunes, and wildly primitive beaches. Outer Banks Storm captures this area with its rustic cedar-shingled homes and the sharp tang as a storm blows in from the sea. 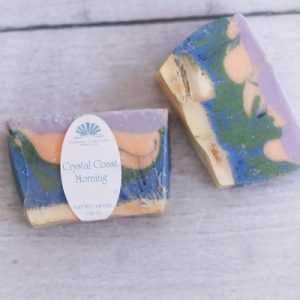 Go south just a little bit and the southern Outer Banks takes you to Crystal Coast Morning. You know those mornings at my in-laws’ beach house I mentioned? I captured them in this scent – sans coffee. 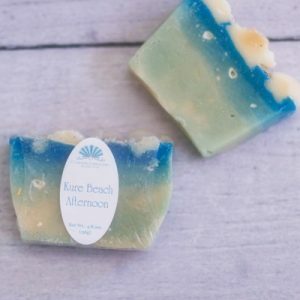 Zippy and fresh, this scent is like waking up on a late autumn morning to an empty beach in the off-season when the air is pure and crisp and all that tickles your ears are the sounds of waves kissing the sand. Keep going a little further south and you arrive at our gorgeous Cape Fear beaches. The Cape Fear River meanders its way from mid-state to the ocean and lends its name to this region. Surf City, Topsail, Wrightsville, Carolina, Kure Beaches… Each wonderful in its own right, depending on what you’re looking for. We generally go to Kure Beach. It’s a quiet beach with a fishing pier and lifeguards, as well as a public bath house and free parking. And I mentioned the water, right? Kure Beach Afternoon is pure ocean with a slight tangy zip underscored by a whisper of sunscreen. It’s hanging out at the beach with a bunch of other local home educating families on a beautiful late summer day as clouds scuttle overhead. And finally, we come to Ocean Isle Beach, easily one of the jewels of our Brunswick County Beaches. This island is paradise just after the season ends when it’s still warm enough to enjoy the beach but the isle isn’t thronged with tourists. My teen and I enjoy weekends away each year to a resort on the island. Wide, powdery, sandy beaches; calm waters; and the rustle of palm fronds overhead as we sit on our balcony or float in the pool. It’s a beach vacation made for chillin’ and sipping something cold and fruity while all the stress melts away. That moment became Ocean Isle Beach. 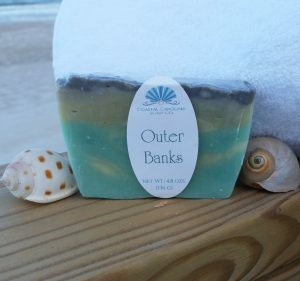 A crisp ocean scent mingles with sweet fruits as you remember what it was like to watch your cares blow away on a warm breeze. Which one of these jewels of the beach would you want to bring back with you? What memories will you love to capture in your shower?